Devon Eugene Malcolm (born 22 February 1963) is a former English cricketer. Malcolm was one of Englands few genuinely fast bowlers of the 1990s. 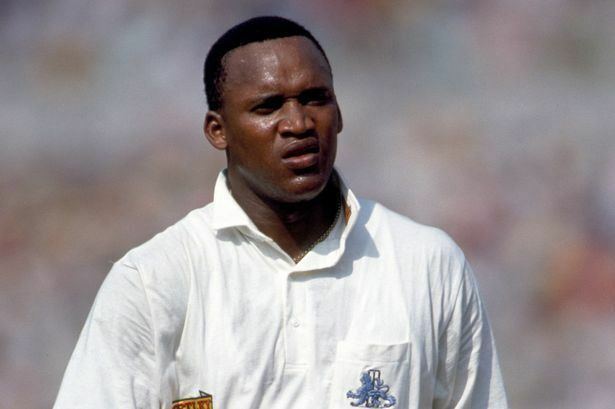 Born in Kingston, Jamaica, he settled in England, making his first-class debut for Derbyshire in 1984, and qualifying to play for England in 1987. He played in 40 Test matches for his adopted country, but took part in just ten One Day Internationals. On his day he was one of the fastest bowlers in world cricket, but his playing style was also notable for his short-sightedness and poor catching, his powerful throwing arm, his perceived profligacy with the ball and his undoubted ineptitude with the bat. His under-average ability as a batsman seemed however to add to his popularity, and he was often given a big cheer when he went out to bat, more often than not at number eleven, a position for which he was often in competition with Phil Tufnell. He hit some huge sixes for both England and Derbyshire and was a particular favourite of commentator Brian Johnston. As the cricket writer, Colin Bateman, noted, "Malcolm, incredibly wholehearted with an easy charm off the field, became a national hero". Malcolms chance to play for England came when several members of the then current Test team announced their intention to take part in a rebel tour to South Africa during the 1989 Ashes series, thereby disqualifying themselves from selection for the rest of the series. He was lucky to make his first international appearance in the Fifth Test of against an Australian cricket team already 3–0 up in the series, and his first day in international cricket ended wicketless. But then, so did all his team-mates, for this was the occasion on which Mark Taylor and Geoff Marsh batted together unbeaten throughout the first day. On the second day of the match, Malcolm finally managed his first scalp at this level, and it was that of Steve Waugh for a duck – although it made little difference to the outcome, and Australia crushed England by an innings. Malcolm scored 14 runs in his two innings at the bottom of the order, including a four and a six, which perhaps raised false hopes as to his batting ability. He also scored his top Test score of 29 off only 18 balls in a later series against Australia, which included three fours and two successive sixes off Shane Warne. Other "high" Malcolm scores included 18 against the West Indies despite being hit by several short deliveries, and 15 not out against India in a last wicket stand with Eddie Hemmings including a powerfully struck six. 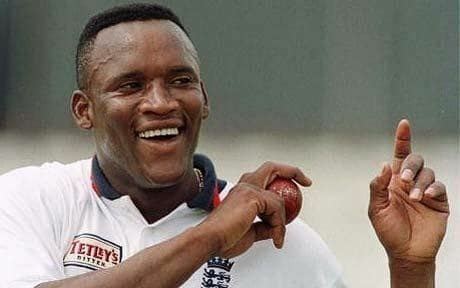 On the West Indies tour in 1989/90, Malcolm excelled as England won the First Test, took ten wickets in the Second Test and, with nineteen scalps in four Tests, returned as Englands leading wicket-taking bowler of the trip. On 20 August 1994, playing for England against South Africa at The Oval, Malcolm was hit on the helmet by a bouncer while batting against Fanie de Villiers. He was incensed by this, exclaiming to the South African slip cordon the now famous words "You guys are history", and hit back with his greatest spell of international bowling, ripping through the South African batting order to finish with figures of 9–57, at the time the sixth-best innings analysis in the history of Test cricket. His performance was subsequently ranked 91st in Channel 4s 100 Greatest Sporting Moments in 2002. It was also the best bowling analysis, in Test cricket, by an English fast bowler in the 20th century. Malcolm was named as one of the five Wisden Cricketers of the Year in 1995. Malcolms relationship with the then England team manager Ray Illingworth became strained and culminated in a row during the following series against South Africa in 1995–96. He was also reported to have had disagreements with Englands then bowling coach, Peter Lever. Malcolm bowled poorly with the second new ball in the final Test which allowed Dave Richardson and Paul Adams to make 73 for the last wicket.